Craft soda is a great side project for homebrewers. It requires no extra equipment, and will be appreciated by the members of your squad who don't drink. We sell easy soda extracts to get you started, but the real fun begins once you start to get creative. What makes this recipe different? Well, it represents a stark departure from the Coca-Cola's of the world. It isn't sickly sweet, loaded with high high fructose corn syrup, artificial flavors, and too much caffeine. Instead, this recipe asks the question: can soda be a healthy, delicious, and refreshing beverage? Making soda is easy and usually involves two approaches, either natural or forced carbonation. Natural carbonation involves letting yeast begin to ferment the sugars available in the soda in a closed container (glass or PET bottle). The amount of CO2 produced by the yeast carbonates the soda before any real alcohol is produced. Forced carbonation most commonly involves a homebrew kegging system. No yeast needed, just dissolve sugar in water, mix in your soda extract, and carbonate. The following soda recipe uses a homebrew kegging system for forced carbonation. The inspiration for the recipe comes from former NB employee Ilya Soroka. Check it out below. Place the sanitized funnel in the open keg hatch and position it under your juicer. Juice the oranges, carrots and ginger (I typically find juicing the ginger knobs with the carrots or oranges easier than alone). Top the keg off with water to desired level of consistency and sweetness. Attach the keg lid and purge head space with CO2. Carbonate with CO2 to 3 - 4 volumes. Keep refrigerated at all times to maintain freshness. No sugar added, all natural and delicious. And this is just the beginning; pick your favorite fruits (and/or veggies), juice them, and carbonate. Not to mention, those who just like carbonated water can make their own "club soda." 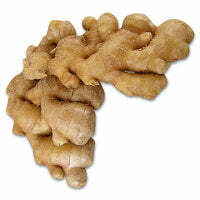 * This is what a "branch" of ginger looks like, way bigger than a "knob."